Wowowowow. That’s all I can say about this lasagna recipe. I don’t ever intend this site to be some type of recipe blog, but I do think with nutrition, it’s important to showcase a few wins in the kitchen. This recipe was one of them. 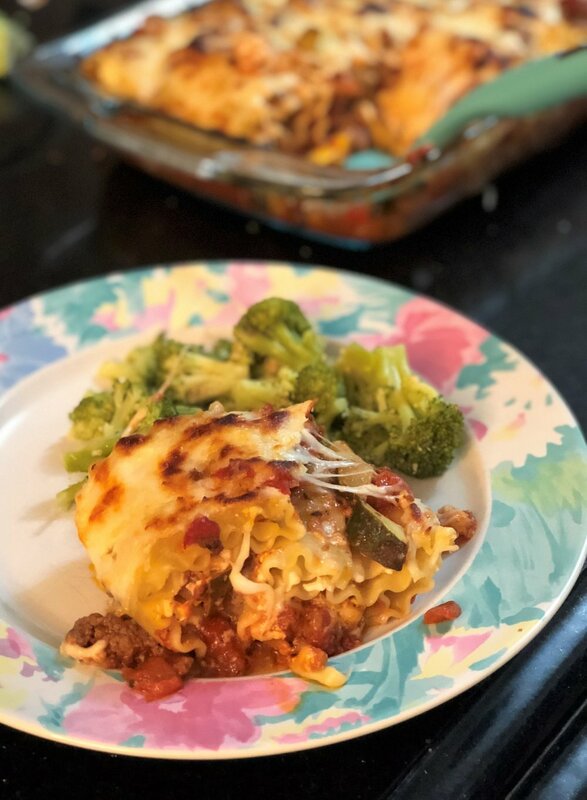 Typical lasagna recipes are full of ground beef and sausage, but with Gastroparesis, that is not something my digestive system can handle a bunch of. However, my husband is definitely a meat and potatoes kind of guy, so we compromise. Most weeks consist of 3 meals with meat and 4 meals without. It seems to be a good balance for us. 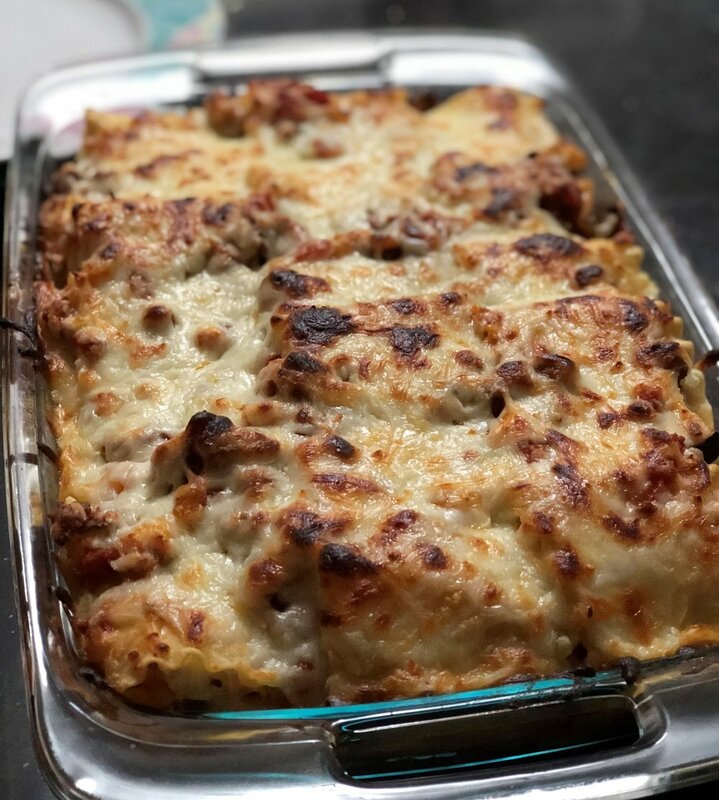 This lasagna was a beautiful combination of both. Instead of 2 lbs of meat, I threw in 1 pound and then substituted with zucchini and squash triangles. It added that perfect meatiness to it. Give it a try and let me know what you thought about it. Preheat oven to 375. Boil a pot of water and cook the noodles as directed on the package. Drain and lay out on foil to dry and cool down. While the noodles are cooking, diced the onion, and cube the zucchini and squash. Heat the oil in a pan, add onion and garlic and cook until translucent. Add the beef, zucchini, squash and salt and pepper. Cook until beef is browned. Add in diced tomatoes, tomato paste, 1 tbsp parsley and 1 tbsp basil and more salt and pepper to taste, as needed. Bring to slight boil and then lower heat to simmer for about 35 minutes. Stirring occasionally. Combine ricotta cheese, egg, Parmesan, the remaining parsley and basil and salt and pepper. Spoon in sauce mixture into a 9x13 casserole dish to cover the bottom. Evenly spoon ricotta mixture onto each noodle sheet. (about 1 tbsp per noodle) Then, drizzle the meat sauce on each noodle sheet. Roll up each noodle and place in dish sideways. You should be able to get 5-6 lasagna rolls per row for 3 rows. Top the rolls with the remaining meat sauce and then add mozzarella to cover. Bake in the oven for 20 minutes. If you like that browned cheese flavor, broil for 3 minutes. Serve with garlic butter broccoli and ENJOY! If you make this, let me know in the comments your thoughts or send me pics of it! We LOVED it. It also made enough for 3 meals for both of us! So, 6-8 servings.